LineageOS 15 for HTC One E8 Dual (e8) is now available to download via an EXPERIMENTAL development build. 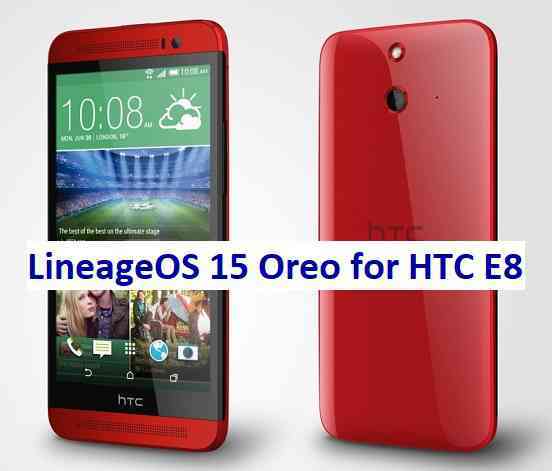 This post provides the download link to the Android Oreo based Lineage OS 15 for HTC One E8 Dual (e8) and guides through the installation process of the same. This LineageOS 15 for HTC One E8 Dual is brought to you by developer aj20010319. No donation link found for aj20010319. If you want the OFFICIAL Lineage OS 15 update or some more Android Oreo ROMs then stay tuned to the LineageOS 15 Download page or the AOSP Oreo ROMs devices list page. Here is the Lineage OS 15 for HTC One E8 Dual VERIZON, instead, if you are looking for ! THIS IS AN INITIAL TEST BUILD WHICH HAS MANY BUGS. HAVE A BACKUP BEFORE FLASHING THIS AND TRY AT YOUR OWN RISK. Installing a custom ROM requires an unlocked bootloader on HTC One E8 Dual, which may VOID your warranty and may delete all your data. Before proceeding further you may consider backup all data on the phone. Understand that you are the only person making changes to your phone and I cannot be held responsible for the mistakes done by you. – Here is the TWRP update guide for HTC One E8 Dual. This recovery guide requires an unlocked bootloader on HTC phone. Reboot and Enjoy Android Oreo with LineageOS 15 for HTC One E8 Dual. Copy the latest Lineage OS 15 for HTC One E8 Dual ZIP file to the phone. Stay tuned or Subscribe to the HTC One E8 Dual (e8) forum For other Android Oreo, Nougat ROMs, LineageOS 15 ROMs, other custom ROMs and all other device specific topics. I tried using this rom on my HTC ONE E8 dual sim (m8sd) but it showed some mount failure in TWRP and failed to boot. Any help possible please ? error link, i can’t download, pls update! The link has been taken by the developer. Anyway, as @gregferns mentioned in the last comment, that it was not booting and probably a buggy build. Now there is no ETA of new build. But I assure you to add as soon as it will be available. as soon as possible be developed again.. Anyone can build P for this device please ?? Or is it never going to happen ?? Even Oreo build will do.